Canadian women received the federal right to vote in three waves of legislation. It began with Prime Minister Robert Borden initiating the Military Voters Act of 1917, which enabled Canadian women on active service to vote. Borden also implemented the Wartime Elections Act that same year, which extended the vote to Canadian women who were related to men in the military forces. Lastly, on May 24, 1918, royal assent was given to a bill extending the vote to Canadian women who met the same qualifications as voting men. These quick and successive formative events caused confusion for the public. The collection of Library and Archives Canada (LAC) holds various letters written by Canadian women that demonstrate the impact of the vote and include questions about their own personal eligibility to cast a ballot. Seeking information directly from the source, women wrote to Prime Minister Robert Borden and other government officials. In a letter dated December 1919, Mrs. King of Colonsay, Saskatchewan inquired if she was eligible to vote as a Canadian citizen married to an American citizen. Her inquiry was forwarded to the Department of Justice, which replied that she should be eligible to vote based on her information and enclosed a copy of the Act. They also noted that her inquiry was not typically an affair for the Department. The confusion between the Dominion Elections Act and the temporary wartime voting measures is evident in a letter dated February 17, 1919 from Mrs. Lillian Dill of Oshawa, Ontario. Mrs. Dill requested a copy of the Act in order to understand its impact and her eligibility to vote. 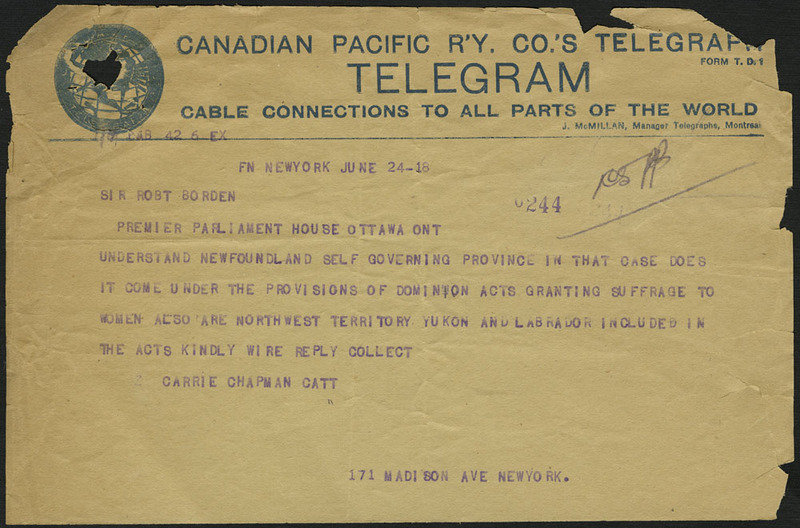 Ms. Carrie Catt inquired in a telegram whether the extension of the wartime voting measures applied to the Northwest Territories, Yukon and Labrador, or if these areas are exceptions like Newfoundland, which is a self-governing province. Lastly, on behalf of the Ontario Woman Citizens’ Association, Mrs. Edith Lang of Toronto, in a letter dated December 4, 1919, outlined concerns that were raised by the women in the association, such as the right to vote for Canadian women married to foreign citizens, and the right to vote for foreign women married to Canadian men. As these letters in LAC’s collection demonstrate, Canadian women were eager to exercise their right to vote. The struggle for equality would continue with the Persons Case of 1929, a constitutional ruling that permitted women to be appointed to the Senate. It would not be until 1960 (when Aboriginal peoples were permitted to vote) that all Canadian women, regardless of race, were granted the vote in both provincial and federal elections. Please join the celebration of women’s suffrage with the exhibition, Let Them Howl: 100 Years of Women’s Suffrage, hosted at the Festival du Voyageur in Winnipeg from February 12 to 21, 2016 and on the Rideau Canal Skateway in Ottawa from January 28 to February 15, 2016. This entry was posted in Exhibitions, Our Collection and Facilities and tagged Canadian Museum for Human Rights, exhibition, Let Them Howl: 100 Years of Women’s Suffrage, right to vote, women’s suffrage by Library and Archives Canada Blog. Bookmark the permalink.